A quality Sunflower with hybrid vigour as well as being pollen-free, making a stunning addition to borders as well as an intriguing cut flower. 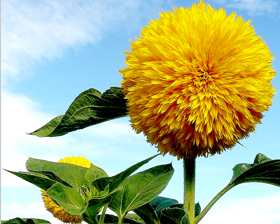 The golden-yellow, fully-double 25cm blooms have attractive crested centres, and flower over a long period. Sow early spring to early summer outdoors where they are to flower. Prepare the ground well and rake to a fine tilth before sowing. Sow 12mm deep in rows 45cm apart. Germination usually takes approximately 21 days.